Once you’ve assembled the chassis you can get it on the track to see how it runs. The adjustments are quite simple. 1. Does the suspension always return to centre? There’s a methodical way to work through this, back off both spring adjusters all the way to start with. a) Take the chassis off the body and see if the motor pod returns to level after you bounce each rear wheel. If not, it’s either friction (or interference) in the mounts or the motor wires are too tight. Pull them towards the motor a little so there’s a few millimetres of slack. b) Once you’ve got it returning to centre, refit the chassis to the body and try again. The most common issues next are the top of the motor pod interfering with the underside of the vacform interior, or the motor wires are too tight. c) Once it bounces and returns to centre, put the car on the track and check the car is level. If not, adjust the softest side up by turning the spring adjusters about 1/2 turn at a time, then try again. With the car on the track, give it a bounce on each side and it should return to centre each time. 2. How does it lean in corners? 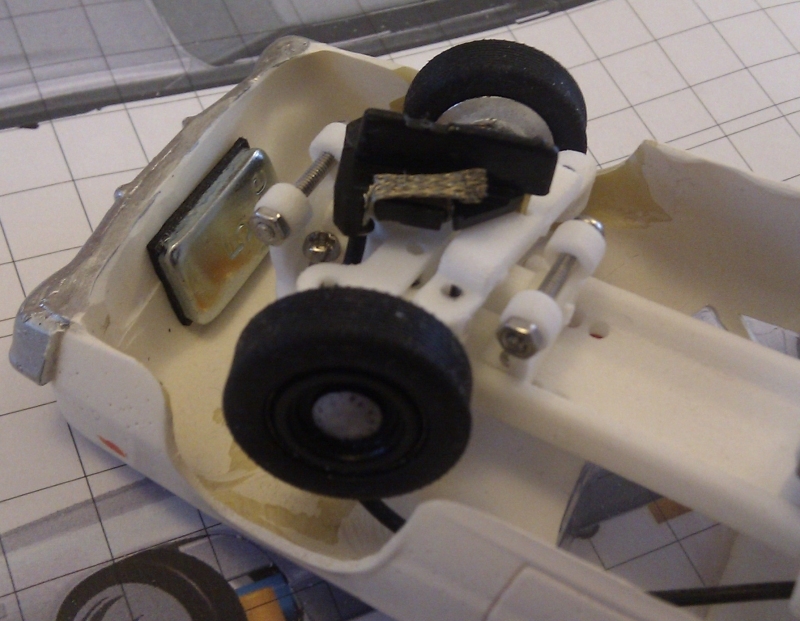 If it leans too far (and the tyres foul inside the bodyshell) you can adjust the grubscrews in the front suspension. These limit the amount of travel. Wind them clockwise to reduce the amount of suspension travel. 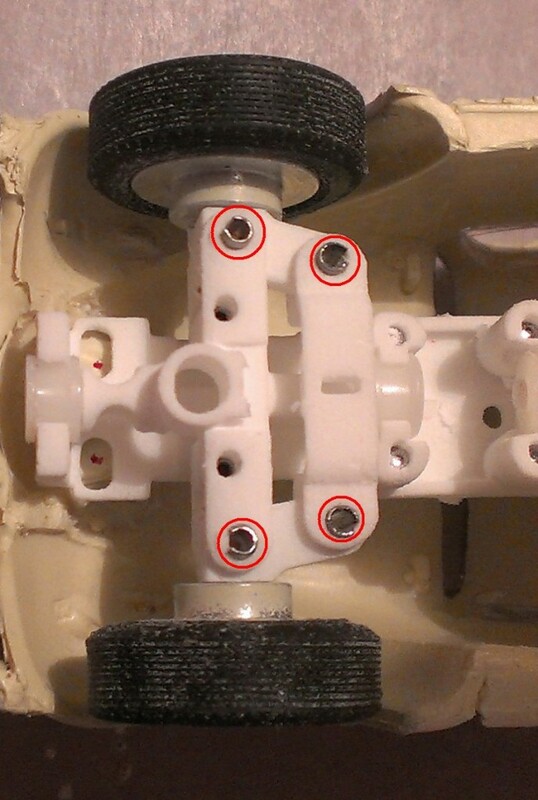 If it doesn’t lean far enough, check to see the front suspension grubscrews are backed off enough. It could also be that the motor pod is hitting the underside of the car’s interior or even that the motor wires are too tight and restricting the movement. Is there any interference between the front wheels and the body? Perhaps you need to Dremel away more material from inside the body, or raise the bodyshell a little from the chassis. Add a washer to the body posts to space them further apart. I sometimes use a little weight up inside the roof to make the car’s centre of gravity higher, this can also help the car to lean more. 3. Does it roll and steer smoothly? Check there’s no dirt or debris caught in the mechanisms, sometimes it can get tangled in the wheels. As with all slot cars, are the braids touching the track properly? As many racers know, having motor pod rear suspension allows lots of grip at the rear wheels. This sometimes means that there’s so much grip the guide can jump out of the slot. You may need to add weight at the front, keep it low down. If the guide jumps out of the slot, add more weight at the front. If the rear slides too much, remove weight from the front. 4. Happy with its performance? 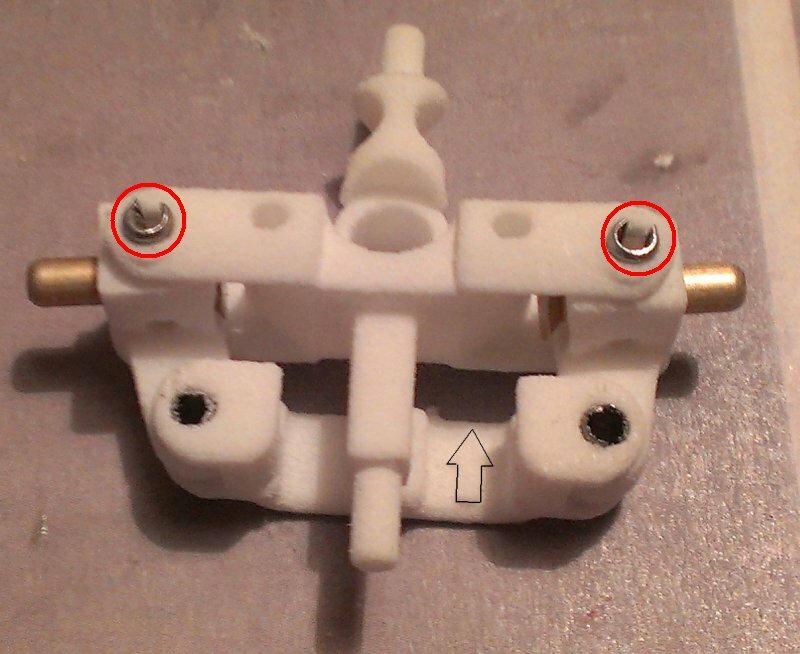 I use a tiny blob of superglue on the 2mm pivot pins of the steering. On the front crossmember for the kingpins, and on the top of the steering linkage. This stops them from falling out. On all the screws (012-601 and 602 only) I put a tiny amount of paint, this stops them working loose but means it’s easy to take things apart if you need to. That’s everything I’ve ever needed on the cars I’ve built and they’ve never put a foot wrong even after hours of brutal abuse. If you have a problem that you can’t seem to solve please drop me an e-mail and I’ll be happy to help.